This Android Volley Tutorial describes how to use Android Volley library. 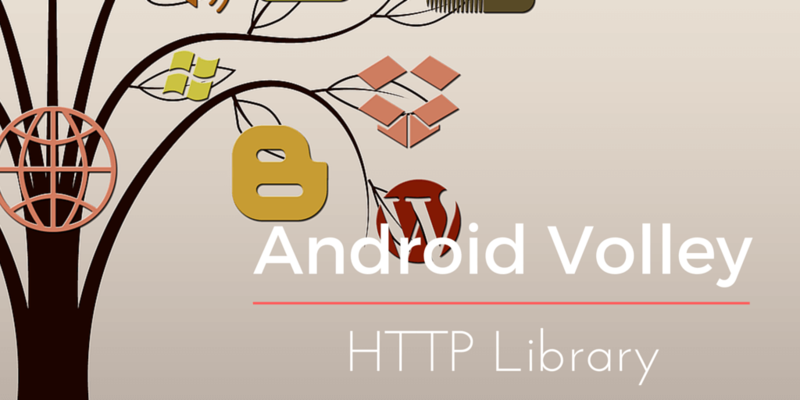 Android Volley is an Google library that helps developers to build HTTP clients in Android. This library handles HTTTP request and response. 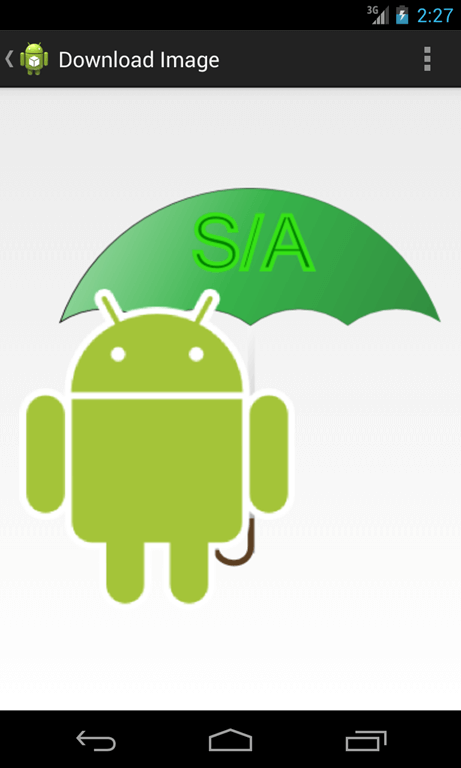 This library simplifies the Android app development. In the previous post, we talked about HttpUrlConnection It is valid and useful but using Volley we can simplify our work. Once we get the code, we can build up our project. If you notice the code you download is meant for Android Studio. Don’t forget to set the project as library.or you can add it to your project using gradle. Why use Volley in Android? These points are enough to choose Android Volley as our base networking library. In this post, I will show some basic operations with Volley while in some other posts I will show some other more “complex” operation. This code line creates a RequestQueue instance with default parameters. If we want to have more control, we can instantiate this class directly. Once we have our request queue instance, we can add our requests. Network requests are instances of Request class. Usually, we have everything we need under the toolbox package, but we can always customize our request extending Request class and providing our logic. Response class is the class we use when we want to listen to the response data or to the error events. We will see it in more detail later. If we don’t have special needs, we can use some classes in the toolbox package. These classes help us handling common requests: string request and image request for example. The first one is called when the response is received and is ready. In this case the onResponse method is called. This method runs in the main thread so we can update, for example, some UI widgets. If something goes wrong, the ErrorListener.onErrorResponse is called. In this method, we have the chance to handle the error and notify it to the user. In this case, we create a key called param1 and pass the value stored in param parameter. At the end, we need to add our request to the request queue. In the first method, we have to extract the data from the response while in the other one we notify the response. We will cover these aspects in some other posts. At the end of this post, you know how to implement an Android app that uses HTTP connection to send and retrieve information from a remote server. You can use this knowledge to invoke APIs. Love the tutorial, but you say at the end: "Source code available soon." I (and I'm sure others) would love to have this as full project as a downloadable zip! –what code are you using to print (output) to the the activity view? –is there a textview involved? 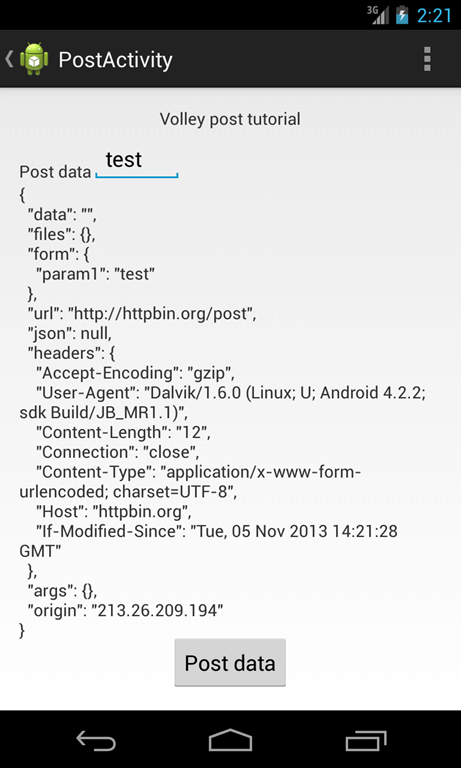 –what is the .xml file for the layout of this app? It is post and download Image! Hi, I want to post without response to a URL that opens a new view please how can I achieve this. Similar to setting action in a html form and clicking submit button. could you please tell me how to take the image response which is Bitmap object out his callback method? i have gone through so many websites and video tutorials,but i didn’t get any idea about volley library.But after watching your tutorial i got the exact idea about Volley.thank you for your great information towards the volley.I am expecting knowledge for rest of the topics also.